Now that this year's Earth Day is behind us, I'm not stumbling over children's books obviously related to the environment/ecology all over the Internet. Which leads me, again, to be thinking about what kinds of books I should be considering for encouraging an appreciation of the world in children. I still like the idea of providing experience, rather than a lesson. I'm also still loving the interview I heard a few weeks ago about Thoreau recording all kinds of information about Concord's flora and fauna. This weekend I'm hoping to get a very young family member started on a Thoreau-like experience, maintaining a nature journal filled with dried leaves and flowers and maybe pictures of that creepy flock of turkeys in his backyard. (Recognizing that turkeys are disturbing is a sort of appreciation.) While I know a wild turkey when I see one, I'm only familiar with a few trees. Fortunately, there are books to help with that sort of thing. Scholastic has a whole list of Books for Teaching About Plants and Trees. I'm particularly interested in that apple pie book. 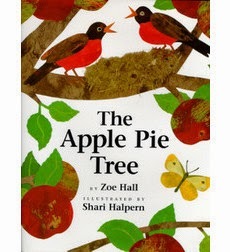 When we do our apple tree thing, we can finish with pie.